This document provides building code specifications addressing ramp construction, ramp safety and proper ramp railing and guardrail construction. This is the fulltext document. We compressed the file, with no data loss, so that it can be loaded more-quickly into your computer or smartphone. 1016.3 Maximum slope: The maximum slope of means of egress ramps in the direction of travel shall be one unit vertical in 12 units horizontal (1:12). The maximum slope across the direction of travel shall be one unit vertical in 48 units horizontal (1:48). BUILDING CODES for STAIRS model codes for Canada, U.S.
Add railings on your ramp: if the ramp crosses above a ditch, ravine, or is more than three feet from the ground at its highest point, a railing is likely to be required by local and national building codes. Even for ramps that are just a few inches above the ground, railings improve ramp safety by providing additional visual clues about the ramp's slope as well as providing a grasping surface in case of a fall. Our photo (left) shows the author's daughter (at left, ca. 1979) with a friend, demonstrating that this building access ramp was unsafe: a railing was provided only on one side despite the drop off, and the railing that the carpenters installed was both open (a child hazard), and used a horizontal mid-height member, easily climbed-on by a child (another child hazard). and see HANDRAILS & HANDRAILINGS. Railings in stair codes and specifications refer to the safety barrier along ramps as well as at steps or stairs, landings, and balconies. 1003.3.3.11.3 Handrail grasp ability. Handrails with a circular cross section shall have an outside diameter of at least 1.25 inches (32 mm) and not greater than 2 inches (51 mm) or shall provide equivalent grasp ability. Edges [of th handrailing] shall have a minimum radius of 0.125 inch (3.2 mm). 100333.11.4 Continuity. Handrail-gripping surfaces shall be continuous, without interruption by newel posts or other obstructions. Our photo illustrates a high ramp crossing over a busy highway in Guadalajara, Mexico. The guardrail is continuous, probably has adequate strength, but lacks child-safe enclosing balusters. 1607.7.1.1 Concentrated Load. Handrail assemblies and guards shall be able to resist a single concentrated load of 200 pounds (0.89kN), applied in any direction at any point along the top, and have attachment devices and supporting structure to transfer this loading to appropriate structural elements of the building. 1607.7.1.2 Components. Intermediate rails (all those except the handrail), balusters and panel fillers shall be designed to withstand a horizontally applied normal load of 50 pounds (0.22 kN) on an area not to exceed one square foot (305mm2) including openings and space between rails. Is this access ramp handrailing (photo at left) actually graspable? Not very. All of the model building codes contain descriptions of graspable and non-graspable handrailings by dimension, shape, profile, support, obstructions and other parameters. Details are at GRASPABILITY of HANDRAILINGS. PM-305.5 Stairs and railings: all interior stairs and railings shall be maintained in sound condition and good repair. Commentary: Handrails, treads and risers must be structurally sound, firmly attached to the structure, and properly maintained to perform their intended function safely. During an inspection the code official should inspect all stringers, risers, treads, and handrails. PM-305.6 Handrails and guards: Every handrail and guard shall be firmly fastened and capable of supporting normally imposed loads and shall be maintained in good condition. PM-702.9 Stairways, handrails and guards: Every exterior and interior flight of stairs having more than four risers, and every open portion of a stair, landing or balcony which is more than 30 inches (762mm) high, nor more than 42 inches (1067mm) high, measured vertically above the nosing of the tread or above the finished floor of the landing or walking surfaces. Guards shall be not less than 30 inches (762mm) high above the floor of the landing or balcony. Guards are required on the open side of stairs and on landings and balconies which are more than 30 inches above the floor or grade below. The guard must be at least 30 inches above the floor of the landing or balcony. 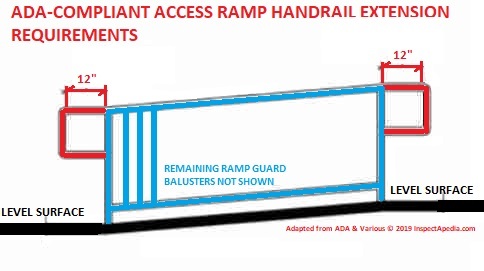 Handrails shall be provided along both sides of a ramp run with a rise greater than 6 inches (152 mm) and shall conform to the requirements in Sections 1012. If handrails are not continuous, they shall extend at least 18 inches (305 mm) beyond the top and bottom of the ramp segment and shall be parallel with the floor or ground surface. Ends of handrails shall be either rounded or returned smoothly to floor, wall or post. Handrails shall not rotate within their fittings. 1. Handrails are not required when the total ramp run rise is 6 inches (152 mm) or less and the horizontal projection is 72 inches or less, except where required to be accessible. 2. Aisles in Group A occupancies (see Section 1025). 505.10.1 Top and Bottom Extension at Ramps. Ramp handrails shall extend horizontally above the landing for 12 inches (305 mm) minimum beyond the top and bottom of ramp runs. Landing platforms for ramps: Make sure the ramp is properly designed in width, structural support, and that it includes a landing both at the upper end at a building entry/exit door, and where required by local code or ground surface conditions, also provide a landing platform at the ramp's lower end. As we mentioned at our page to photo, the step at this building access ramp entry reduced the ramp slope to less than 1:12 but it created an obstruction for wheelchair users. While the landing platform assists the users of this access ramp, what we had specified was that the ramp bottom end terminate at grade, without a step. And this platform is probably too short in the direction of travel. The "railings" along this ramp are not readily graspable, but as the ramp is nearly level, we considered them as a balcony railing not a handrail. Ramp Landing requirement: Ramps shall have landings at the bottom and top of each ramp, points of turning, entrance, exits and at doors and in accordance with Section 11-4.8.4. Landings shall comply with Sections 1010.6.1 through 1010.6.5. - Florida Building Code 1010.6 Landings. Ramp Landing slope: Landings shall have a slope not steeper than one unit vertical in 50 units horizontal (2-percent slope) in any direction. Changes in level are not permitted. - Florida Building Code 1010.6.1 Landings. Ramp Landing width: The landing shall be at least as wide as the widest ramp run adjoining the landing. - Florida Building Code 1010.6.2 Landings. Question: what is the meaning of "accessible route of travel" and when is a 1:8 ramp slope acceptable? Our local code, UBC, 1003.3.4.3 starts with the maximum slope of 1:12 in "an accessible route of travel", other ramps can be 1:8. Can you give the meaning of " an accessible route of travel? And how is " other ramps " acceptable at 1:8. I am short on room. Thanks for your helpful question about the definition of an "accessible route of travel". My understanding is contextual. In ADA and similar standards, the writers mean, by "accessible route of travel", a route or passage that is intended to be ADA compliant for use by wheelchairs. A continuous unobstructed path connecting all accessible elements and spaces of a building or facility. Interior accessible routes may include corridors, floors, ramps, elevators, lifts, and clear floor space at fixtures. Exterior accessible routes may include parking access aisles, curb ramps, crosswalks at vehicular ways, walks, ramps, and lifts. Watch out: In the UBC where the slopes you ask about are discussed, a wheelchair ramp pitched at a 1:8 slope (1" of rise in every 8" of horizontal run) is the maximum slope allowed (be careful in reading websites as some sites don't understand slope and call this the minimum but in my lexicon the steepest slope would be the maximum or steepest slope allowed) - this isn't a recommended slope. The recommended maximum slope for a wheelchair ramp is 1 inch of rise in 12 inches of run. That is less steep and thus easier to negotiate. Where you are short on space even with a 1:8 slope, and need to comply with the ADA I'd look at a ramp with landings and turns to make the total ascent. Excerpt from "ADA Accessibility Guidelines (ADAAG)"
4.3.3 Width. The minimum clear width of an accessible route shall be 36 in (915 mm) except at doors (see 4.13.5 and 4.13.6). If a person in a wheelchair must make a turn around an obstruction, the minimum clear width of the accessible route shall be as shown in Fig. 7(a) and (b). Below we provide a link to the full text of the ADA. In the Definitions section of that document you'll find helpful definitions of ramp slope and accessible route and other terms. Continue reading at RAMP LANDING CODES or select a topic from closely-related articles below, or see our complete INDEX to RELATED ARTICLES below. Or see GUARDRAILS on BALCONIES, DECKS, LANDINGS for details about safety railings on landings and open hallways, porches, screened porches, balconies - horizontal walking surfaces. RAMP BUILDING CODES at InspectApedia.com - online encyclopedia of building & environmental inspection, testing, diagnosis, repair, & problem prevention advice.